We do a lot, but we firmly believe what we do should not be hard to explain. We are looking for elegant and straight forward solutions to the complex problems that face investors. Our clients’ goals drive the long term decisions we make for our portfolios. When the money is needed, how much volatility the client can tolerate over that time, and what the level of interest is in various global markets determines the long term “strategic” asset allocation. These decisions are made infrequently, and drive the majority of the risk and return experience for our clients. The views we form on the near term opportunities and challenges in the world drive our short term decisionmaking, our “tactical” asset allocation. Because we are patient capital investors, even the short term is thought of in months and years. We will respond to situations where we can make decisions for our clients that can be implemented in a disciplined and meaningful way. Markets do not operate in a vacuum. They are affected by the events and forces that swirl around us on a daily basis. Whether it is politics, or the weather, a national holiday or the 24 hour news cycle, investors react, and these reactions express themselves in the behavior of markets. The first thing we do every day is be informed. We rely on a variety of sources from print publications to news wires to cable outlets and blogs. The goal is to gather a lot of information, decide what is most likely to drive markets vs. what is noise, collate what is we deem most material, and assemble a view based on it. We also pay attention to the analysis assembled by other individuals, whether from news organizations, research firms, investment banks, NGOs or governmental agencies. We have a sense developed over decades of who provides the most thoughtful and reliable perspectives, but we also try to listen to those with whom we do not regularly agree. We find the best path to the right answer is usually illuminated by those who challenge our thinking the most. Markets are mechanisms for evaluating and pricing the information provided by the real economy and the policies applied and commerce that takes place in it. We take the world view which we have formulated and look for patterns and behaviors in the market that we believe are responsive to our view. Often, there is as much information if not more in examples of how the market does not follow expectations. These situations may challenge our thinking and send us back to do more research on our world view, or they may point to an opportunity to address a risk or gain some advantage by anticipating how the market will react when it recognizes what we have identified. Our market view is not static and evolves with our world view. Forming a world view and a market view are both intellectual exercises. The next challenge is transforming these views into actions that can be taken in a client’s portfolio. Some aspects of our views translate directly – a favorable view on precious metals for instance might be expressed through purchasing a security that represents gold or silver. Other aspects of our views might be seen through indirect translation. A view that the price of oil is headed lower might be expressed by owning airlines, chemical companies or other industries where oil is a major input. Some views might be considered of global importance, but do not translate at all into decisions that can be made in a portfolio. In such an instance the view might become a touchpoint that must be revisited regularly because it might be a signal of other risks or opportunities in the markets. 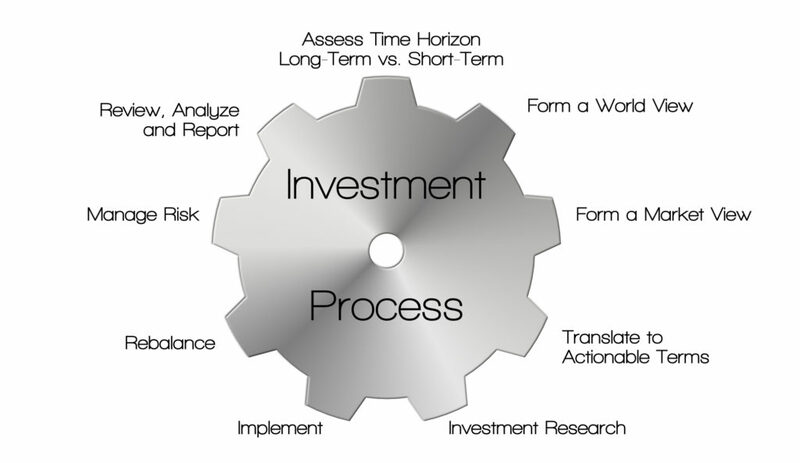 Once views are formed and translated into researched funds for investment, portfolio construction begins. The WCM team has an overall framework for how our clients’ assets are exposed to various markets and factors, from US equities to foreign bonds, real assets and cash. The overall strategic asset allocation for a client is keyed to that client’s expressed and documented investment objectives. The objectives are established as a policy for the client’s account, and governs what the portfolio’s exposures will generally look like over long periods of time. WCM will then make tactical asset allocation adjustments around that strategic allocation as we interpret and react to news and markets to manage risk and uncover potential opportunities. The strategic and tactical asset allocations together describe what a client’s total exposure looks like at a certain moment in time. Researched funds are purchased and sold in proportions that reflect the combined asset allocations. WCM employs what we call active rebalancing for client accounts. Rather than exclusively rebalance on a set schedule or when the portfolio drifts by more than a certain amount, we monitor accounts and make an active decision to rebalance when conditions are appropriate. We believe it is an equally active decision to do nothing and allow the portfolio weights to shift with the markets. This can be advantageous in times of market stress when a typical rebalancing formula would have the client’s account selling the stable investment and buying more of the falling investment. The WCM team would rather make a proactive decision to rebalance or to hold fast instead of letting a computer make that decision without the benefit of world and market views. There is no opportunity for return without taking risk. The key is taking calculated and appropriate risks with an expectation of what the benefit to the portfolio will be. Unaccounted risks are the landmines of investing. WCM attempts to formulate a comprehensive inventory of the risk taken through the strategic and tactical asset allocation and fund selection and makes sure it comports with the client’s objectives and WCM’s views. Not every risk can be managed, but it can be recognized and understood, and measured in the context of the overall investment experience. WCM makes available a full suite of reports through our platform partner TD Ameritrade which our clients can access and review on account holdings, transactions, and performance. We also write extensively on our blog, for our library and in our periodic reports to clients about our views, what we see unfolding in the markets, and how this affects client investments. The WCM team tries to dispel the mysticism around markets and investing. We want our clients and their advisors to get an inside take on what and how we think.